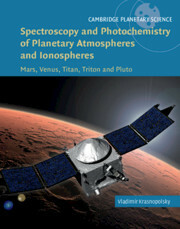 Spectroscopy and Photochemistry of Planetary Atmospheres and Ionospheres Krasnopolsky Vladimir A. Add to cart the livre of Krasnopolsky Vladimir A. The chemical composition of any planetary atmosphere is of fundamental importance in determining its photochemistry and dynamics in addition to its thermal balance, climate, origin and evolution. Divided into two parts, this book begins with a set of introductory chapters, starting with a concise review of the Solar System and fundamental atmospheric physics. Chapters then describe the basic principles and methods of spectroscopy, the main tool for studying the chemical composition of planetary atmospheres, and of photochemical modeling and its use in the theoretical interpretation of observational data on chemical composition. The second part of the book provides a detailed review of the carbon dioxide atmospheres and ionospheres of Mars and Venus, and the nitrogen-methane atmospheres of Titan, Triton and Pluto. Written by an expert author, this comprehensive text will make a valuable reference for graduate students, researchers and professional scientists specializing in planetary atmospheres. Preface; 1. The Solar System; 2. Atmospheric structure; 3. Spectroscopy; 4. Aerosol extinction and scattering; 5. Quantitative spectroscopy; 6. Spectrographs; 7. Spectroscopic methods to study planetary atmospheres; 8. Solar radiation, its absorption in the atmospheres, and airglow; 9. Chemical kinetics; 10. Photochemical modeling; 11. Mars; 12. Venus; 13. Titan; 14. Triton; 15. Pluto and Charon; References; Index. Vladimir Krasnopolsky was previously a Research Professor in the Department of Physics at the Catholic University of America, Washington, DC. An expert on spectroscopy and photochemical modelling, he is the author of three books, four book chapters and 153 refereed publications. He is one of the most highly cited scientists working on planetary atmosphere research and was awarded the USSR State Prize in 1985 for his studies of Venus. He has worked on many space missions throughout his career and was the Principle Investigator of the airglow spectrometer on the Mars 5 spacecraft and the Venera 9 and 10 missions to Venus, the three-channel spectrometer on the Vega mission to Venus, and the infrared spectrometer on the Phobos 2 orbiter.